This was our final full day in Acadia before we had to end our vacation and head home. We awoke to a sunrise, but this time it quickly gave way to a thick fog. It was our first morning with fog. Every other day had been a bluebird day. This foggy day was more like what I was expecting to see here and it was actually nice to have a day like this, although we were wishing the fog would burn off a little as we were passing over summits. Since we most of Friday kayaking, we started this day with a hike. We've not used to kayaking in the ocean in the fog either, so we geared up for a hike. Two days earlier, when we were on Pemetic Mountain, I was admiring the open ridge of Penobscot Mountain. 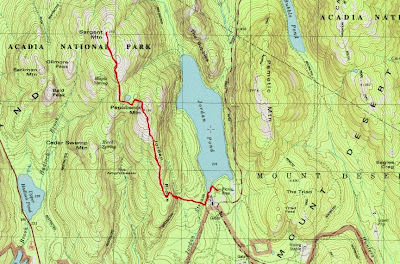 We decided to hike Penobscot from Jordan Pond and then continue on to Sargent Mountain before returning back along the ridge. We were both hoping the fog would burn off as we got up on the ridge, but it wasn't to be. A glacial erratic on the lower part of Penobscot ridge. Visibility was nil along the Penobscot ridge during the ascent. In the scrub before we reached the summit, we met a trail volunteer who was checking on the condition of the Acadia Cairns. We talked for awhile and he gave us lots of useful information on things to see. We pressed on and were soon at the summit. It was fairly warm, but there was a moderate breeze, and with no sun we didn't linger too long. We chatted with a guy at the summit for a few minutes before moving on. We dropped down into the col between the two mountains where there is a small unnamed pond. We could hardly see it in the fog. Sargent Mountain was also in the fog as we reached the summit, so it hardly looked any different than Penobscot. This was our turn around point. 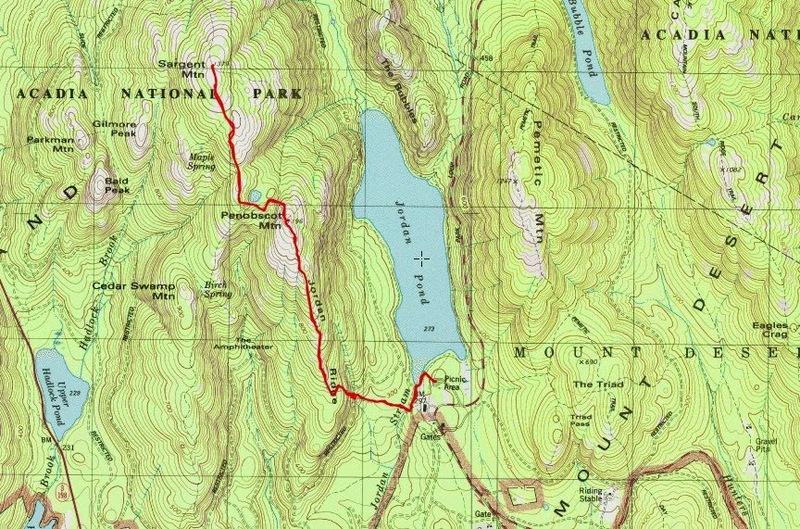 We went back down to the col and passed the pond and began our way back up Penobscot. The sun finally began to break through the clouds. As we regained the summit, we stayed for 30 minutes or so since we could tell it was clearing. The scenery looks a lot different when there is a view! Suddenly we could we the ocean and Jordan Pond and Pemetic Mountain and the Bubbles. Penobscot really was a nice open rock ridge. The clouds were starting to lift as we were passing back over Penobscot Mountain! Jordan Pond with the Bubbles and Pemetic Mountain in the background. 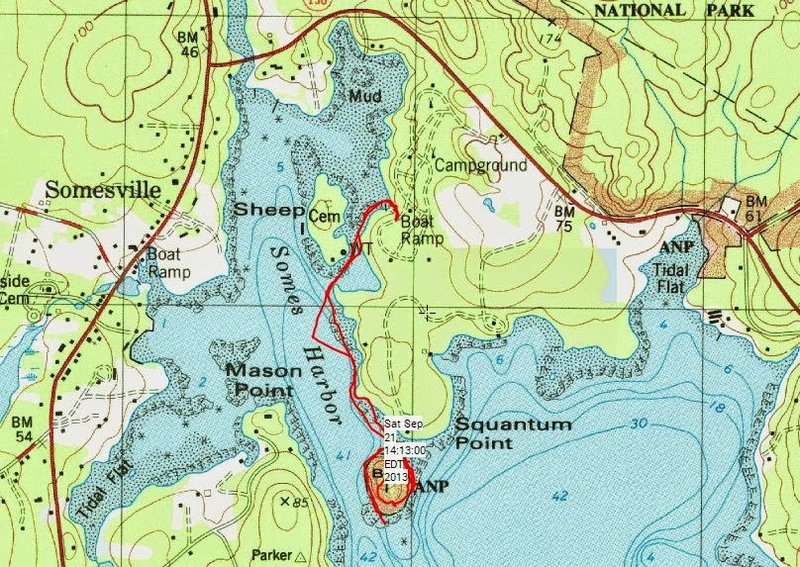 Once back at the car we headed up to Somes Sound to do a paddle in Somes Harbor. We stopped in at Mount Desert Campground to see if we could use their launch, but no one was in the office. 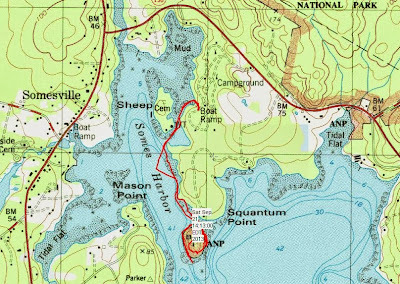 We went ahead and launched, and made our way toward Bar Island in Somes Harbor. 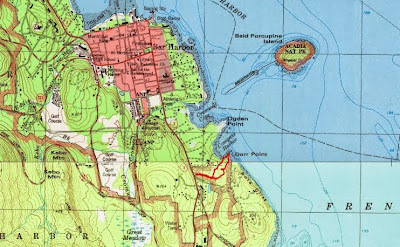 The island is part of Acadia National Park so I wanted to head that way and explore. At low tide it is connected to shore by a sand bar. As we approached the island, the sandbar was only covered in a few inches of water. We went around the west side of the island, but the wind was picking up and the water was getting quite choppy. We returned to the east side of the island and now the sand bar was present. We beached our kayaks there. I went to explore the interior of the island, while Leesa looked for rocks on the shore. The island is closed from February 15-August 31 due to eagles nesting. The island was pretty thick with trees and not much to see so we returned to the boats. We didn't venture into Somes Sound due to the wind. We returned to the campground launch site completing our paddle. We were impressed with Mt. Desert campground and plan to stay there in the future. Nice sites on the sound and nice tent platforms and decks. The tide was definitely much lower upon take out. Our last activity before dark was to go for a short hike at the Dorr Farm ruins located just south of the Town of Bar Harbor. 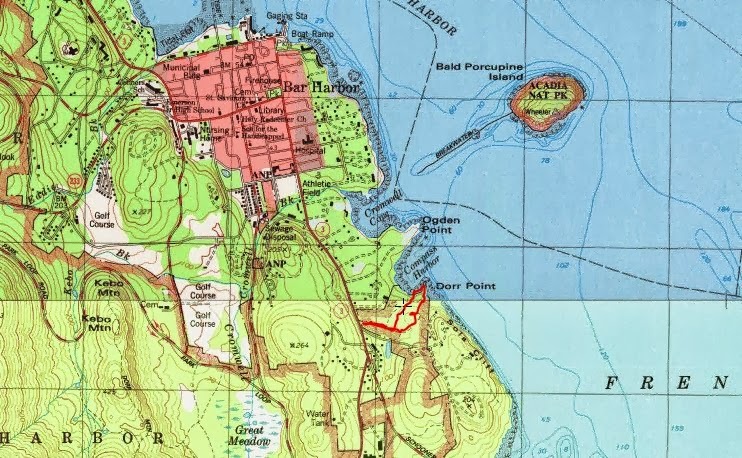 These ru﻿ins are located on a small piece of Acadia National Park property. The history is quite fascinating, and I'm surprised that there is no interpretive signage at the site. George Dorr was considered the father of the Acadia National Park. The foundation of the mansion is now getting overgrown. As we headed back to Seawall campground for the night we stopped at Sawyer's Lobster Pound for dinner.